Young dragon babies usually a very light brown color, tan undersides, and with dull teeth and claws. They have slightly big eyes, short tails and small wings not capable of being used yet. Sometimes, they may have head protrusions. Blissfully ignorant and happy dragons that are always curious about their surroundings. They will sometimes go off from parents to explore and play but not too far by their direction. When it comes to hunting, it is amateurish yet concentrated. Usually when its slightly older, it will attack when it senses a threat. 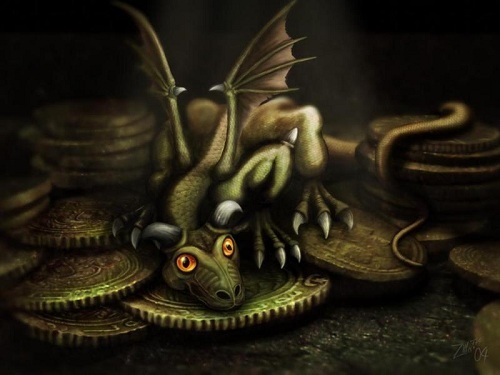 The more common type of Dragons seen, have a chocolate to dark brown coloration with tan undersides and with sharper fangs and claws than when they were Wyrmlings. Their tails are longer and a little more large, providing more strength in battle. An Adolescent Dragon's wings are fully capable of flight. They may possibly have head protrusions. Typically, Adolescents are arrogant and confident in their abilities, though the personality will vary. They go about training to become stronger and compete with other Dragons; this is to better prepare them since the road to an Adult is long and arduous. Otherwise, they may be roaming the lands, consuming mainly carnivorously yet also eating certain plants and berries. Adolescents, like other Basic Dragons, resides in forest grottoes or caves; they are quite territorial as well and will not be afraid to defend it. Fully-grown and large dragons with an ebony-brown coloration and light brown underside. Its eyes are now sharply narrowed with yellow scleroses and slit pupils. Adults are complete with intimidating rows of razor-sharp teeth and four claws on each hand/foot made for ripping and crushing. Two adjacent curved spikes are jutting out from the tip of its tail. Their wings are now strong enough to actually be used in attack maneuvers. They may possibly have head protrusions. These are the more rarely seen of basic dragons due to the time it takes to become an Adult. Just like Adolescents, reside in forest grottoes, caves and mountainous terrains, being a little less territorial than their former selves. These Dragons seek out battles to determine their strengths, or commune with each other peacefully. Adults consume omnivorously, but are mostly meat-eaters.